Scenes from an event in Chhindwara, Madhya Pradesh. In the second week of November 2014 ,18 women died in government sterilisation camps in Bilaspur district of Chhattisgarh. Two years later and 430 kilometres away, a camp was held in Parasia block of Chhindwara district in Madhya Pradesh that was similar in many ways to the one in Bilaspur. It was November 9, a Wednesday, the day of the week when sterilisation camps are held at community health centres in the district. This camp, therefore, was a routine exercise and well-entrenched in the government health services system. On Wednesdays in Chhindwara, regular hospital check-ups and consultations are closed in order to conduct these camps. 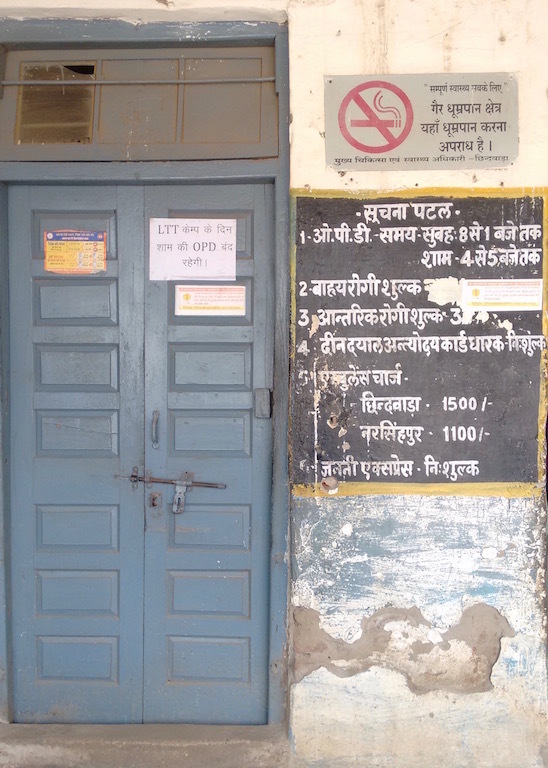 Notice on the door about closure of out-patient services on the day of the sterlisation camp at the community health centre in Harrai, Chhindwara. Photo: Nikhil Srivastav. Despite being organised in an accredited health centre, unlike the camps held in an abandoned building in Bilaspur or at a school in Bihar, this camp was chaotic. Twenty eight women, none of whom looked older than 30, were lying sedated on the floor of a hall. A few auxillary nurse midwives and a female doctor were standing by to assist them. 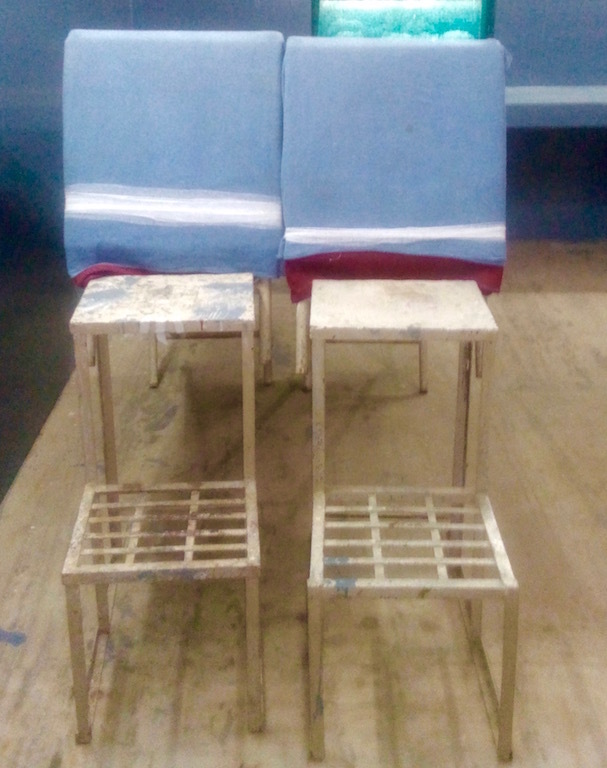 Each woman was accompanied by an accredited social health activist or ASHA to an adjacent room where she was made to sit on the steps of one of the two inclined operating tables, ready to go as soon as woman before her was finished. Women who had been sterilised were carried back to the hall by one of the male assistants. No stretchers were available. A team comprising of a male surgeon, two nurses and two male assistants worked with utmost speed. A sterilisation, timed from the moment a woman was made to lie on the operating table to being carried out, took an astounding four and a half minutes. The team moved swiftly between the two operating tables, doing two operations simultaneously. As soon as the surgeon finished the crucial cuts and moved to the next table, the nurses completed the procedure on the previous one. Inclined operating tables used for tubectomies. Photo: Nikhil Srivastav. It is clear that given the time frame, it would be difficult, if not impossible, to maintain the medical as well as safety and hygiene protocols laid down in the Standards and Quality Assurance in Sterilisation Services of 2014 or those in the Reference Manual for Female Sterilisation, 2014. The medical team also allowd little time between giving a patient local anaesthesia and making the incision. According to the Reference Manual for Female Sterilisation, 2014, which provides uniform standards for surgical technique, the onset of action of the usual dose of local anathesia is typically within three to five minutes. The effect of anathesia is to be confirmed before making the incision or surgery through continuous oral communication. None of this was done. It could very well be the case that to maintain the time, incision was made even before anathesia could have its effect, defeating the very purpose of pain management. One of the guidelines from the Standards and Quality Assurance in Sterilisation Services of 2014 is that the camp timing should be between 9 am to 5 pm. This is particularly important in areas such as this where lack of public transport, early sunsets in winter, and remote locations of the villages around forests make it particularly hard for women and their families to reach home in the evening. At 7 pm not even half of the women had been operated upon. There was no arrangement for them to stay the night, either. The recently operated women, mostly in pain and still sedated, and their families were likely left to fend for themselves. So much for the government’s concept of “family welfare”. The state’s claims of a target-free approach to family planning rings hollow when one speaks to ASHAs, who are often called the backbone of government’s rural health schemes. The ASHAs confirmed that they were expected to get at least two to three women from her village each month to one of these Wednesday camps. Many were worried about not having reached their target for this month due to festivals, and said that they would have to make up for it in the coming months. Writing on the wall that says, "Chase away poverty and disease, get sterilised after having one or two children." Photo: Nikhil Srivastav. Female sterilisation continues to be the main method of family planning in India. The annual health survey of 2012-2013 reports that 59.4% women used any modern method of contraception in Madhya Pradesh. Out of that, 48.7% were sterilised, which is to say that out of total number of women using modern methods, almost 82% have been sterilised. For Chhindwara, it is 82.7 %. Female sterilisation has been one of the most discussed topics and an area of substantial activism for decades in an otherwise neglected field of women’s health in India. Yet, things have not improved, indicating just how poorly India values the wellbeing of its women. The rhetoric of empowerment, choice and autonomy does not stand true when women, mostly from low-income, adivasi and dalit families, are herded into camps to be cut open and sewed back in less than five minutes. Some are lucky to survive. Others like those in Bihar, Bilaspur and Balaghat, die or suffer gravely to satisfy the state’s never-ending obsession with population control. Kanika Sharma is an M.Phil scholar at the Centre for Social Medicine and Community Health, Jawaharlal Nehru University.